Image caption The area affected by the quake is vast, impoverished and sparsely-populated. Rescue teams are struggling to reach remote areas worst hit by the powerful earthquake which struck Pakistan's south-western province of Balochistan. The interior minister said huge efforts are under way but even by helicopter the quake zone is hours away from help. Survivors need more tents, food and water. Officials also say there is a lack of doctors and medical supplies. At least 348 people died and hundreds were injured when a 7.7-magnitude quake hit the region on Tuesday. Interior minister Chaudhry Nisar Ali Khan told the National Assembly that there were still areas which the authorities had not been able to reach by road or by helicopter. Media captionThe BBC's Shahzeb Jillani: "The scale of the disaster is beginning to unfold"
The authorities insist they are capable of dealing with the disaster and the government has not issued any appeals for international help. The affected area is vast, impoverished and sparsely-populated. The rescue and relief effort has been led by Pakistan's official paramilitary force, the Frontier Corps, which already had thousands of soldiers deployed in the area because it is fighting a long-running separatist insurgency by Baloch nationalist rebels. Western aid workers and international charity groups have long been discouraged from working in the province - Pakistan's largest but least populated. More than 300,000 people were affected over six districts - Awaran, Kech, Gwadar, Panjgur, Chagai and Khuzdar - Balochistan government spokesman Jan Muhammad Buledi said on Wednesday. The BBC's Shahzeb Jillani in Karachi says that the district worst affected by the quake, Awaran, is considered a hotbed of the separatist movement and is also the home of a leading separatist militant. Awaran district reportedly has around 300,000 residents. A local government official said about 90% of houses in the district had been destroyed. Most people live in mud homes which collapsed easily and many are feared to be trapped under the rubble. A field hospital is being established there and teams of doctors and paramedics are also on the way. 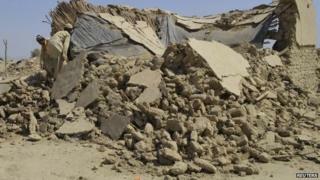 The quake occurred at a depth of 20km (13 miles) north-east of Awaran, the US Geological Survey said. Many houses were flattened forcing thousands of people to spend nights in the open. After the quake an island appeared off the coast near the port of Gwadar, reported to be about 200m (656ft) long, 100m wide and 20m high. Scientists have been sent to survey it as reports say that yet more islands may have emerged along Pakistan's southern coastline. Officials say such land masses have appeared before in the area, and usually disappear again over time. Tuesday's quake was so powerful it was felt as far away as India's capital, Delhi, and Dubai. Workers in Karachi had to evacuate their offices because of the strong tremors. The region is prone to earthquakes, with at least 35 people killed in a 7.8-magnitude tremor that was centred in south-eastern Iran in April. Are you in the area? Send us your comments using the form below.